Shot on a Nikon N80 Film Camera using Velvia 100 Slide Film. 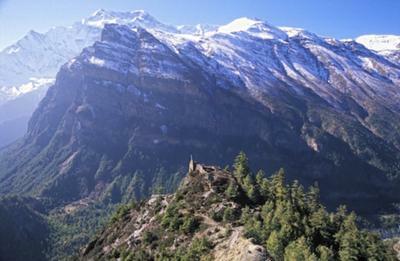 View west along the high trail leading around Annapurna 1. In the foreground is a medieval Tibetan fortress that strategically guards the path and commands a wide view of the valley below. *Images should be submitted with a description about the image of more than 125 words.